The Holy Feet of the Guru removes the Three-fold miseries [*] of the worldly life and helps to cross the ocean of samsara. The divine feet of the Guru is the seed of the eternal bliss and the key to the ultimate knowledge. 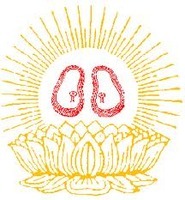 The Sacred feet of the Guru takes us in the path of Bhakti it shows Lord Rama through our mental eye. The Holy feet of the Guru is a storehouse of eternal peace, is the boundless ocean of mercy and compassion. The Divine feet of the Guru purifies every Jeeva on earth, it is every life of Ramadasa. [*] The Three fold miseries are called Adhyaatmika, Adhibhautika and Adhidaivika. The word Adhyaatmika refers to those miseries caused by the mind and body. Sometimes the living entity suffers bodily, and sometimes he is distressed mentally. Both are Adhyaatmika miseries. Miseries inflicted by other living beings are called Adhibhautika like virus, snakes, insects, animals, even other human being etc., As far as the Adhidaivika miseries are concerned, these are natural disasters that originate with the demigods of the higher planets. For instance, we sometimes suffer from severe cold or hot weather, from a thunderbolt, or from earthquakes, tornadoes, droughts and many such natural disasters. Melodious leading to ecstacy! Thanks for sharing.